Berlin manages to encapsulate all that is modern about Europe, whilst not forgetting its turbulent past. 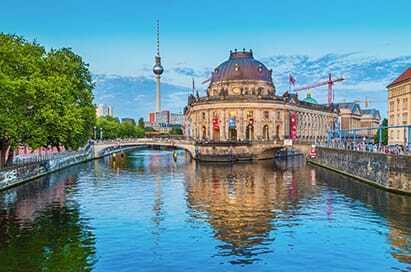 Since the fall of the Berlin Wall in 1989, Berlin has undergone a building boom, and has truly shed the ills of the past to establish itself as a funky, dynamic and creative city. 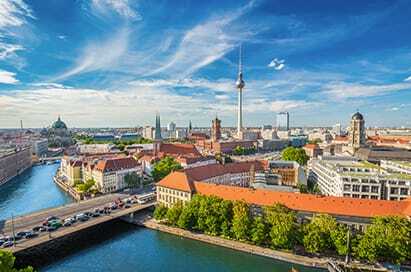 Nowadays, people look to Berlin for the latest trends in lifestyle, music and art as well as taking the lead in the political and economic sphere of the EU. 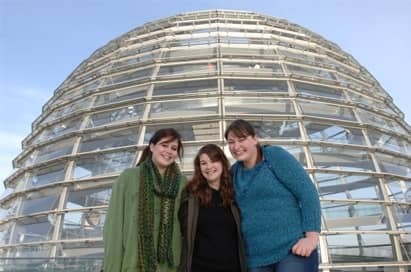 Berlin is a world class city of culture, politics, media and science and therefore students of any discipline will find visits and experiences to enhance their learning and ensure they have an experience they'll never forget. Do you want to discover Berlin 360°? Then you’re in just the right place at the TV tower. From 203 and 207 metres high you can look out over the entire city with its large number of tourist attractions: you can see the Reichstag (Parliament building), the Brandenburg Gate and the Main Railway Station from here, as well as the Olympic Stadium, the Museum Island (Museumsinsel) and the Potsdam Square (Potsdamer Platz). The Funkturm, known colloquially as "langer Lulatsch" ("lanky lad"), offers a wonderful panorama over Berlin. The total height of the filigreed construction is 150 m; there is a restaurant at 55 m, and a viewing platform at 126 m. By day, it offers a panoramic view over the city's houses, the Grunewald forest and the surrounding lakes; by night, visitors can marvel at a city awash in a glittering sea of lights. The home of the German parliament the Reichstag building is a must see. The roof terrace and glass dome offer spectacular panoramic views of the parliamentary and government district as well as Berlin’s main sights. The fastest elevator in Europe takes you to the Panoramapunkt viewing platform at Potsdamer Platz 1. From a height of 100 metres, there is an excellent view over the east and west of Berlin. 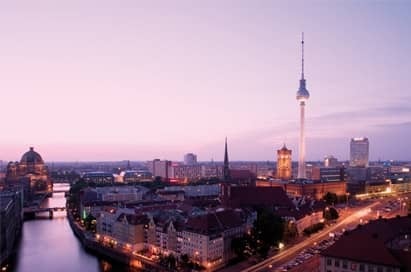 No other viewing point in Berlin offers such as a fascinating view over the entire city, as well as a view of German history. The Panoramapunkt on the top of the Kollhoff-Tower is located directly on the line of the former Berlin Wall at Potsdamer Platz. 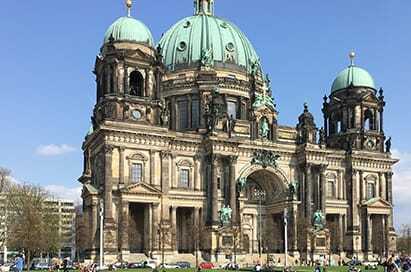 The Cathedral of Berlin is the largest church in the city, and it serves as a vital centre for the Protestant church of Germany. Reaching out well beyond the borders of the parish and of Berlin, the cathedral attracts thousands of visitors, year after year, from Germany and abroad. The Berlin Zoological Garden is the oldest and internationally most well-known zoo in Germany. Opened in 1844 it comprises an area of 35 hectares and is located in Tiergarten, Berlin centre. With almost 1400 different species and around 14,000 animals the zoo presents the most comprehensive collection of species in the world. Charlottenburg Palace is the largest palace in Berlin, and the only surviving royal residence in the city dating back to the time of the Hohenzollern family. The palace was badly damaged during the second world war but has since been reconstructed. The palace and its gardens are a major tourist attraction.